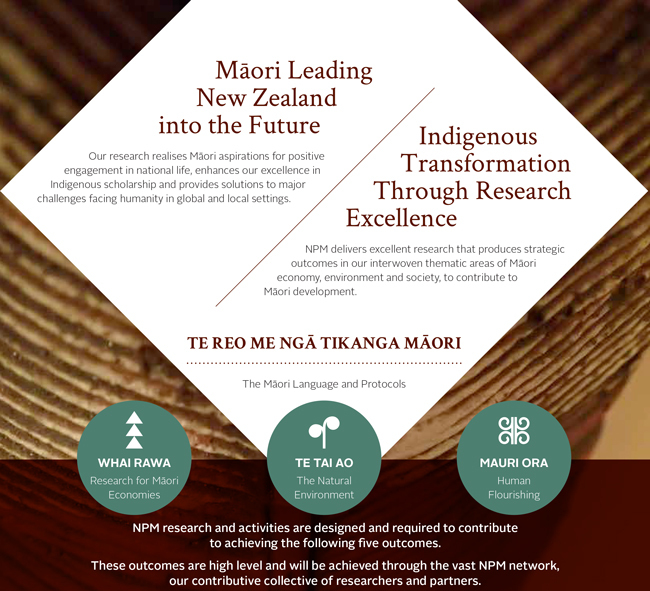 To achieve our vision and outcomes, Ngā Pae o te Māramatanga (NPM) draws on the excellence of not only its researchers and its network but also the ever expanding capability and capacity of Māori researchers in general, enhanced NPM-community responsiveness and the strength of its 15 year track record of transformative outcomes. NPM's focus is on ensuring a better New Zealand by empowering Māori to attain their goals for economic, cultural, social and environmental wellbeing. We believe that Māori can lead New Zealand into the future, using the knowledge and capability that they already have and will continue to generate through NPM and its associated networks and collaborations. The centre is unique in that it is an experienced transdisciplinary, collaborative and cross-institutional Centre of Research Excellence (CoRE). Because of this experience NPM is able to contribute across a broad and interconnected spectrum of research challenges that face communities and the nation. We invest in integrated, inter-sectoral projects across the research specturm, but which are grounded in mātauranga Māori, Māori science, kaupapa Māori and tikanga Māori methods. We also seek out collaborations with leaders and change agents beyond NPM, in our designated areas of interest. Our approach positions the Māori scholar as entrepreneurial, pioneering, motivating and facilitating effective research from within the communities involved and from 2016, we have implemented a new research strategy significantly different in design to previous NPM research programmes. The new research programme which will extend from 2016 - 2020 is comprised of three key themes, Whai Rawa (Māori Economy), Te Tai Ao (Environment) and Mauri Ora (Human Flourishing). These themes are interwoven with a Te Reo me Ngā Tikanga Māori programme, which invests our Indigeneity strongly into the research space. NPM is critically aware of the importance of sharing research outcomes with appropriate audiences, user groups and stakeholders – Māori communities especially – so that positive change can be achieved. We also have programmes and initiatives to support emerging researchers in the field of Indigenous research and which build capacity and capability through our research projects and programmes. Fostering Te Pā Harakeke – understanding, achieving and maintaining healthy and prosperous families of mana and the lessons this may hold for New Zealand families overall. To read about the research projects NPM is undertaking or has undertaken visit the projects listing page and search or browse our projects.